The pure sound of four! A lively, bubbly band of four, Technique formed in 2011 and keep going from strength to strength! 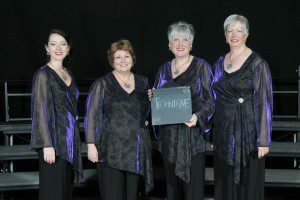 They were voted most improved quartet at the LABBS 2011 convention in Harrogate, and in 2012 were finalist finishing a wonderful fourth place in the quartets competition.